This meet started the way it meant to go on with the arrival of snow on Friday night. Sara was the last of 15 members to materialise after a rather exciting journey from the Hebrides. The next morning Carrbridge had turned into a winter wonderland. Ideas of what to do were hastily revised based on the ability to get to the bottom of the relevant hill and the likely depth of the snow. 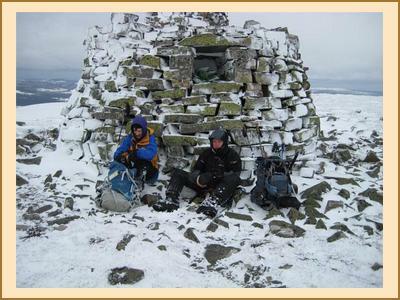 One team comprising Penny, Helen, Ron, Margaret and Callum set off to Ben Wyvis which proved a good choice as most of the snow had been blown off the top of it and they had a reasonable day. Alan, Anne and I decided to tackle the north face of the Hills of Cromdale. This proved yet another surreal experience (see trip notes from Crianlarich). As we got to close to our first summit we could make out some shapes in the spindrift that looked at first like sheep but turned out to be reindeer. Rather than running away they rushed enthusiastically towards us - no doubt hoping that our rucksacks were stuffed full of reindeer snacks. Thwarted, they followed us closely and then one rather loopy reindeer started jumping up either to try and get at our rucksacks or possibly because they realized that we were the sexiest thing on 2 legs they had seen recently. Anne was completely bowled over (literally). We decided this was a bit on the scary side and after eventually shaking them off we spent the next hour looking over our shoulders to see if rampant Rudolph was following us. 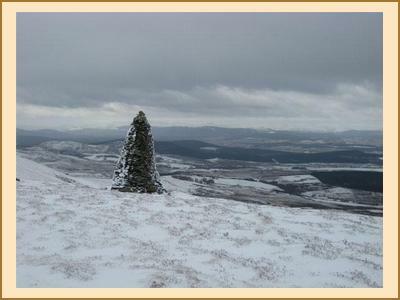 On the second summit is an enormous cairn which contains box with a visitor's book in it. This was where Alan got his second scare of the day because when he opened it he picked up something that mooed at him loudly and promptly dropped it! Don't ask! As Martin would say - there is no such thing as a boring hill... The last thing that we discovered in the nearby pub - while replacing vital body fluids - was that there was a battle on our hill during the Jacobite rebellion and about 400 rebels were killed after the English snuck up on them in the dark. Apparently in their confusion they threw their plaids to the ground and ran off naked. Bit of a different take on the Mel Gibson thing eh? The evening was enlivened by Ewan sabotaging the efforts of anyone to climb anything the next day by producing the biggest and most delicious sticky toffee pudding in the world. He need not have worried as in fact the snow redoubled its enthusiasm. Brave attempts to scale Ben McDui and various climbs in the Northern Corries were abandoned except by Sara and her climbing partner who persevered in the white out, but apparently did not have much fun trying to get back out again. Callum decided to go skiing, which he said was OK as he is a good enough skier to negotiate a slope without actually being able to see it. Fiona and Margaret, rather more sensibly went for a low level walk in the woods. Anne and I went up to Strathfarrar and expended large amounts of energy wading through snow to get to the summit of Ben a Bha'ach Ard. West was a good idea, as here the snow stopped at about eleven o-clock and we even saw a big yellow thing in the heavens on more than one occasion. We had a pretty good day, but as we came back down the A9 that afternoon we were once more in a blizzard. Penny, Helen and Ron also went west and climbed A Chailleach and its neighbour Carn Dearg. They were finally rewarded by spectacular views after nearly freezing to bits in the bitter northerly wind. Three cheers for bothy bags! Kenny and Alison won the prize for the most car miles per metre climbed. Having come to Carrbridge via Glenfinnan they left on Sunday morning for home via Torridon. On Monday it was still snowing. Some folk left early to get home and chill out, pun intended. Ewan and Alan having been thwarted the day before in the Northern Corries drove all the way back to Glen Coe to do some more climbing and make a late entry to the car miles per metre challenge. Ron was last seen eating a large slab of the indomitable sticky toffee pudding for breakfast!